No, coral reefs aren’t really made from sugar, spice, and everything nice. In fact, they’re made from the calcium carbonate that is secreted by corals, which are marine invertebrates. Coral reefs are actually just made up of tons of tiny animals and live off of very few nutrients. Most coral reefs are composed of stony corals, which consist of polyp clusters, which are in the same group of animals as sea anemones and even jellyfish. So basically, coral reefs are comprised of exoskeletons! 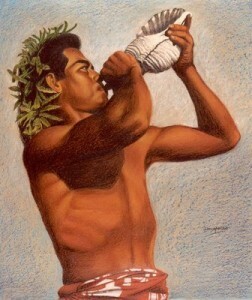 The conch shell is often used as an important tool in Hindu rituals. It is a ceremonial trumpet used in many of their religious practices; it is sounded during the religious ceremonies along with traditional bells and singing. In ancient India, the warriors would blow into the shell to announce battle. One of the Hindu gods, Vishnu holds a conch that represents life, since it comes from water. They also believe that the conch’s sound drives away evil spirits. 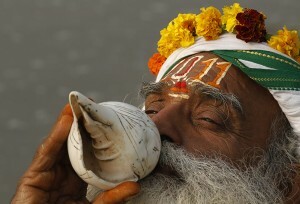 The Conch shell being used in Hindu religious ceremonies. Want to Make a Horn? Did you know that conch shells can be used as wind instruments? You can turn conchs into blowing horns and even trumpets. All you have to do is cut a hole in the shell’s spire, which is near the apex of the shell. The next part is simple! Just blow into the shell as if it were a horn or trumpet. The best kinds of conchs to do this with are Triton’s Trumpet and the Queen Conch. Some native peoples would use them ceremoniously. Posted in Key West | Comments Off on Want to Make a Horn? Old Town Trolley Tours of Savannh recently participated in a very special wedding with NotWedding Savannah to showcase their wedding transportation services. And we think you will agree this was quite and affair! Let Old Town Trolley Tours of Savannah help make your special day unforgettable! The NotWedding Savannah from Munn Brothers on Vimeo. You are currently browsing the Old Town Trolley Tours Blog blog archives for May, 2014.